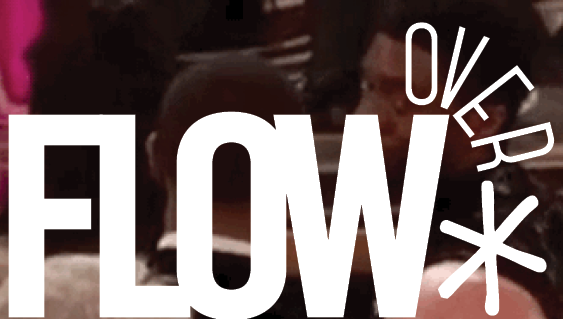 This essay is the first piece of a larger project we are mapping through articles on Flow that examines the ways in which white, liberal, middle-class, educated elites—a demographic that closely overlaps with the target audiences for so-called “quality” TV and streaming content—are complicit in the maintenance and promotion of white supremacy. The press has done some of the work of unpacking the economic and political reasons behind the now-infamous statistic that 53% of white women voted for Donald Trump. We want to add to that conversation by analyzing a sizeable programming cycle we call Horrible White People shows that has emerged on television in the last 2-3 years. We see this representational trend as intimately tied to recession, the emergent mainstreaming of feminism(s), the unmasked visibility of racial inequality and violence, and changes in TV production and distribution models. This column focuses on the cycle’s white women in emotional distress or facing mental illness—women who distract viewers from the plight of minorities most impacted by Trump’s policies and broader political agenda. Like all Horrible White People, these female characters work together to televisually foreground a supposedly precarious, threatened, middle-class whiteness. In the Trump era and on these shows, people are confronted for the first time in several decades with the failure of their white middle-class identity to grant them the privilege of stable or easy-to-find jobs, accessible home ownership, and long-term relationships. The range of emotional distress these characters face is broad, from grief (Fleabag) to pervasive ennui (Divorce, Catastrophe) to textually diagnosed and treated mental illness as on You’re the Worst, Crazy Ex-Girlfriend, and UnReal. Rachel Goldberg (Shiri Appleby), the central character on Lifetime’s behind-the-scenes-of-reality-TV soap opera, gives us one of the most overt examples of the racialized dynamic of these sad white women (see also You’re the Worst s3e12, “You Knew it was a Snake”). In the first season of UnReal, Rachel, a producer on the Bachelor-clone show-within-a-show, Ever After, returns to work after an on-camera breakdown and several months in hospital under psychiatric care. 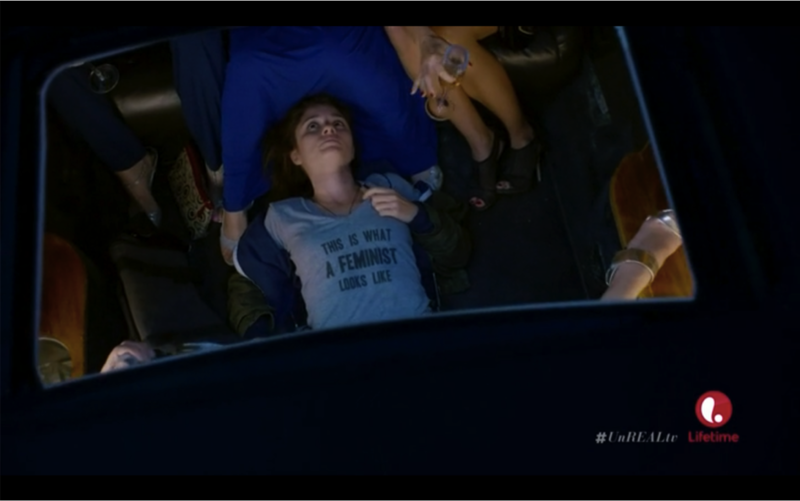 The slogan on the t-shirt she wears on her first day back, This is What a Feminist Looks Like, becomes ironic in the shot above where a resigned-looking Rachel is photographed through the open sun roof of a limousine, lying on the floor of a car filled with evening gown-decked postfeminist girls looking for love on reality TV. The show’s first season is an often incisive satire of a complex cultural moment in which mainstream postfeminism clashes with the language of (re)emerging feminism coming out of the mouths of Rachel and her mentor Quinn (Constance Zimmer). The first season is even self-aware about the racial exclusivity of that emerging feminism and the work that supposedly trashy popular culture like the Bachelor or Ever After does to maintain patriarchy and white supremacy. Indeed, it’s those tensions, between Rachel’s expressed progressive politics and her complicity in maintaining and celebrating the status quo via being a very skilled reality TV producer, that leads to her relapse into mental illness (she is pictured in hospital, in therapy, and taking medication, but never given a specific diagnosis in the show) in the backstory leading up to the show’s first season. 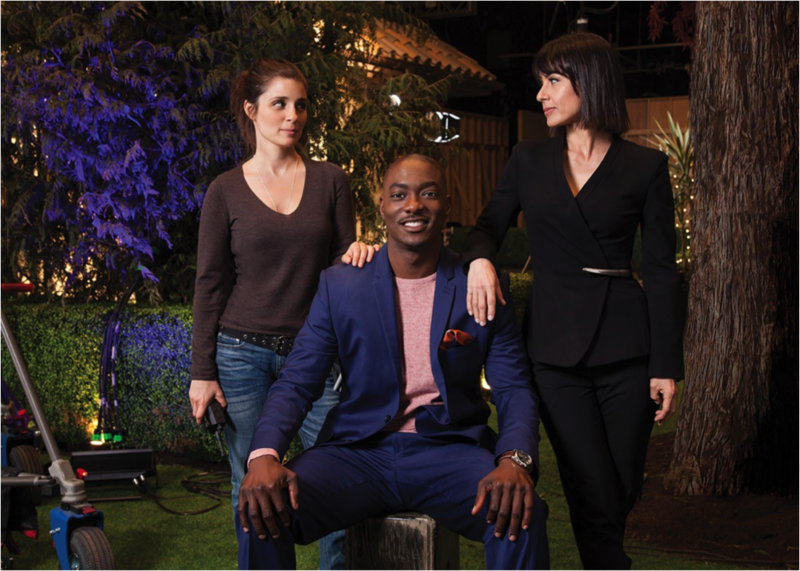 You can see just from this promotional image that while the black suitor is centered in the frame and in the text of the show-within-a-show, it is really the two white women flanking him that audiences should be interested in. Rachel, in jeans on the left, stands slightly behind but also above the suitor with a walkie in one hand and the other resting possessively on the suitor’s shoulder. Quinn, opposite in the black suit, leans casually against Darius’s (B.J. Britt) other shoulder. Its casualness makes the pose an eloquent gesture of power. The two women make eye contact with each other, further setting Darius apart and illustrating—for those who know the premise of the show—their control over his performance. Rachel and Quinn’s eye contact also prioritizes the relationship between the two white female frenemies as the most important relationship on the show. So while Rachel directly states her intention to promote black representation, the show’s narrative structure centralizes white women and Rachel’s trauma and sadness over the victimization of black people rather than actually working toward more equitable representation in front of and behind the camera. 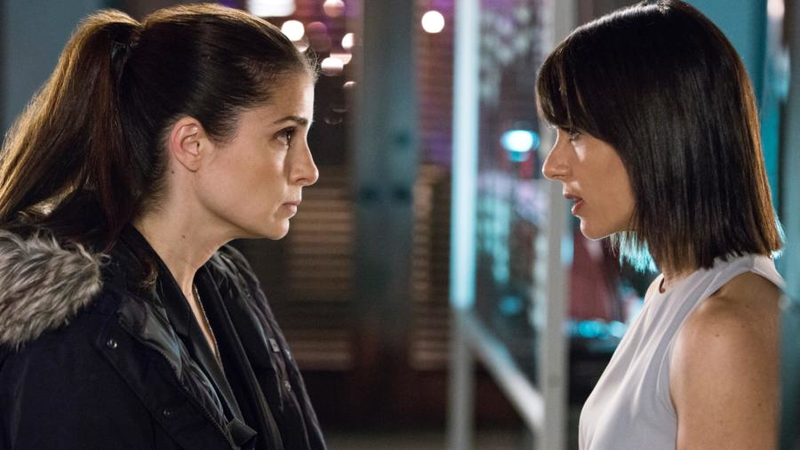 UnReal’s second season offers a rare, explicit representation of a liberal white feminist’s efforts to ameliorate racial injustice and her simultaneous complicity in racist cultural structures, including mainstream television. Rachel’s initial recognition of her position of cultural power, both as a white person and as the showrunner of a highly rated reality television show, creates the potential for good ally-ship—using one’s privilege to create spaces where those with less access to power can speak and be heard. But Rachel’s mental illness and resultant erratic behavior instead turns a narrative about police violence against black men into one about white women’s health. In episode 207, “Ambush,” Darius needs to blow off some steam after being sequestered on set for weeks. He and his friend/manager, along with two of the white female contestants, borrow a car from set and go joy riding. Rachel, seeing the opportunity for dramatic television, calls the police and reports the car stolen. She and another member of the production team state outright that calling the police on two black men in a supposedly stolen car “isn’t going to end well.” Rachel and the other producer hide behind bushes filming the incident as police pull over the car, ask Darius and his manager to step out of the vehicle, and eventually point their weapons at the two black men. Rachel, thinking she can de-escalate the situation, runs out from behind the bushes, startling the cop into shooting both Darius and Romeo (Gentry White). The rest of the season then shifts not to a representation of unjustified police violence against black men, but instead focuses on Rachel’s deteriorating emotional state as she tries to deal with her culpability in getting two men shot. In this cycle generally, mental illness does more than represent female oppression, often creating character development and offering insight into a character’s interiority. But taken together, the existence of this trope across a large programming cycle suggests a broader cultural function to the mentally ill horrible white lady character. Rachel’s distress in season 2 parallels the contemporary context of middle-class white women’s hurt or confused responses to criticisms of their version of feminism. Mental distress in these programs, then, doesn’t function as a metaphor for personal or even gendered containment (think Stepford Wives or Gaslight). Rather, it seems to be part of a dystopic vision of the world that includes economic precarity (whether from a gig economy like on UnReal and You’re the Worst, divorce on Girlfriends’ Guide to Divorce, or failed entrepreneurialism on Fleabag and Casual) for the traditionally stable white middle- and upper-classes. Economic precarity is further paired with political upheaval and a relatively rare self-awareness of white privilege and recognition of the ineffectiveness of white liberal politics that these female characters don’t know how to rectify. This narrative move, centering Rachel’s experience and indeed her control over the entire situation, both foregrounds the power that comes with her whiteness, and offers a fictional version of the ways in which white middle-class feminists so often center their own emotional responses to violence and inequality experienced by others instead of searching for intersectional political responses. So rather than mental illness being a way to contain white women, it’s a way for Rachel to explain her incompetence and actually deleterious contribution to dismantling structural racism. White women’s mental illness then becomes a way to re-contain or control black characters while it alleviates responsibility for structural oppression or indeed for correcting those structures from sad white ladies. 2. 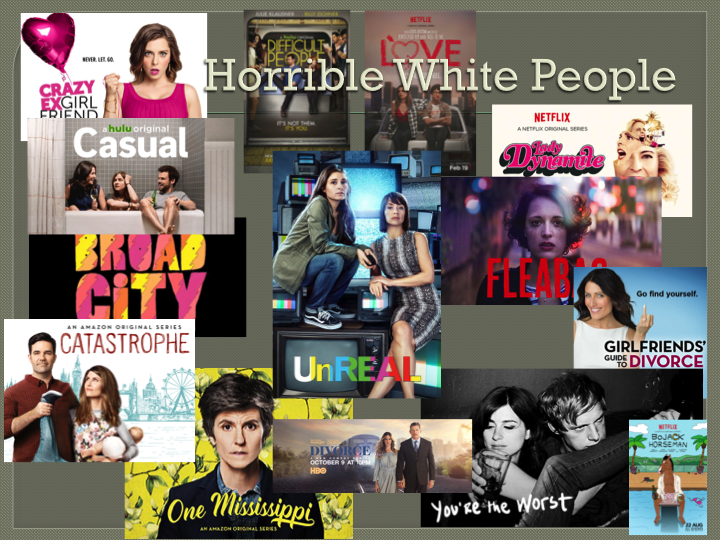 Just a few examples of Horrible White People Shows. 4. A promotional image of season 2 of UnReal.